Turkey stands at the crossroads of world politics: caught between the West and the Middle East; bordering Syria and the frontiers of ISIS; excluded from the EU and governed by an increasingly hard-line leader. Recent events – both the failed military coup and Erdoğan’s subsequent nationwide crackdown – have propelled this young democracy into a new chapter of turbulence. These titles delve into the recent happenings and relevant history behind the headlines. As Turkey’s democratic future hangs in the balance, these writers trace the fault lines in Turkish society back to the Ottoman Empire, and chart the progress of current ideological conflicts from past to present. So, if you’re looking for books that will shed a little light on Turkish politics, look no further. We have everything you need, from social commentary to military history, all available here. Acclaimed writer Kaya Genç has been covering his country for the past decade. Here, he meets activists from both sides of Turkey’s political divide: Gezi park protestors who fought tear gas and batons to transform their country’s future, and supporters of Erdoğan’s conservative vision who are no less passionate in their activism. He talks to artists and authors to ask whether the New Turkey is a good place to for them to live and work. He interviews censored journalists and conservative writers, both angered by what has been going on in their country. He meets Turkey’s Wall Street types as well as the young Islamic entrepreneurs who drive Turkey’s economy. While talking to Turkey’s angry young people Genç weaves in historical stories, visions and mythologies, showing how Turkey’s progressives and conservatives take their ideological roots from political movements born in the Ottoman Empire, united in their determination to make their country more democratic. He shows a divided society coming to terms with the 21st Century, and in doing so, gets to the heart of the compelling conflicts between history and modernity in the Middle East. What is the Gülen Movement and why is Turkey’s President Erdoğan so convinced that the organisation and its charismatic leader were behind the failed military coup of 15 July 2016? The Gülen, or Hizmet, movement in Turkey was until recently the country’s most powerful and affluent religious organization. It its head is the exiled Muslim preacher Fethullah Gülen, who leads from a gated compound in the USA. The movement’s central tenet is that Muslims should engage positively with modernity, especially through mastering the sciences. At hundreds of Gülen-run schools and universities worldwide, instructors have cultivated the next generation of Muslim bankers, biologists, software engineers and entrepreneurs. In this groundbreaking study, Caroline Tee analyses the complex attitudes of Gülen and his followers towards secular modernity. Considered against the backdrop of Turkish politics, Gülenist engagement with modern science is revealed as a key source of the influence the movement has exerted. This revised edition of a classic text builds upon and updates its twin themes of Turkey’s continuing incorporation into the capitalist world and the modernization of state and society. It begins with the forging of closer links with Europe after the French Revolution, and the changing face of the Ottoman Empire in the 19th century. Zürcher offers a strongly revisionist interpretation of Turkey’s founding father, Kemal Atatürk. In his account of the period since 1950, Zürcher focuses on the growth of mass politics; the three military coups; the thorny issue of Turkey’s human right’s record; the alliance with the West and relations with the European Community; Turkey’s ambivalent relations with the Middle East; the increasingly explosive Kurdish question; and the continuing political instability and growth of Islam. Zürcher argues here for the essential continuity of the late Ottoman Empire with the Republic of Turkey that was founded in 1923. He shows that Kemal’s ‘ideological toolkit’, which included positivism, militarism, nationalism and a state-centred world view, was shared by many other Young Turks. Authoritarian rule, a one-party state, a legal framework based on European principles, advanced European-style bureaucracy, financial administration, military and educational reforms and state-control of Islam, can all be found in the late Ottoman Empire, as can policies of demographic engineering. The book focuses on the attempts of the Young Turks to save their empire through forced modernization as well as on the attempts of their Kemalist successors to build a strong national state. Mustafa Kemal, a.k.a Atatürk, is the most famous figure in modern Turkish history. But what was his path to power? And how did his early career as a soldier in the Ottoman army affect his later decisions as President? Gawrych tracks Kemal’s life from the War of Independence to the founding of the Republic and shows that only by understanding Kemal’s military career can one fully comprehend how he evolved as one of the twentieth century’s most extraordinary statesmen. Delving into Kemal’s military writings, orders, political decisions, speeches, and private correspondences, this book provides a rounded and nuanced portrait of the making of a major statesman. 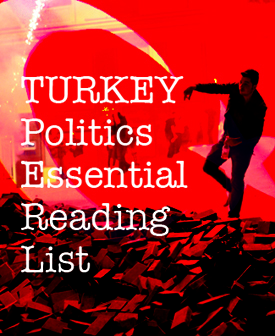 Tags: Books, History, Kaya Genç, Middle East, Politics, Reading List, Society, Turkey. Bookmark the permalink.